FIRST THING'S FIRST, I love my clients. My clients really do keep me on top of things. Like day light savings for instance. It’s around the corner! Thanks for the reminder (you know who you are). But good thing it’s spring forward! This is the easier one of the two (even if we lose an hour of sleep). Start thinking about the new clock time and work with that. Don’t look back and think about what time it was yesterday. So, if your little naps at 12:30, I work to keep the nap at 12:30 on the new time. I wouldn’t start pushing the time later. Keep it simple for yourself. Sometimes it's easy to overthink this. This can definitely feel like one of those things that are easier said than done (especially if this is your first go at daylight savings with your little one). If you stick to the new clock though and adjust things accordingly, so will your babe. This works best for those sensitive sleepers and for those with two or more naps happening. I use the week before daylight savings to move the schedule by 15 minute increments every couple days. And by schedule I’m talking about eating and other activities too. Shift everything together, as these activities are signals to the body of when things happen around sleep. This will keep everything in sync and not throw off their little body clock. Our littles thrive on routine! On the flip side, if you have a flexible sleeper or only have one or no naps, spring forward is pretty easy to adjust and start the morning of. This is often the biggest mistake we make. Sleeping in. Even though we are not getting more sleep, letting your little sleep past 7am can really mess things up. 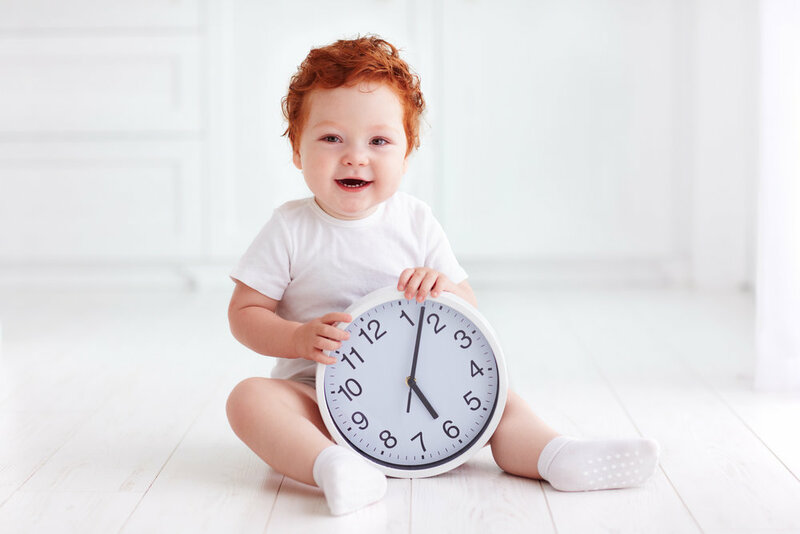 Make sure your little one is up by 7am to preserve nap times. You can try to make those super early risers (ya know the 5:30/6am kiddos) sleep till 6:30/7am. Then adjust timing accordingly the rest of the day. BUT, this may only work for a few days (maybe a week). Don’t be surprised if things creep back and presto! Right back to an early riser. Sorry… it happens. Daylight savings can feel daunting sometimes. Yes, it’s an hour change. This one hour can be a huge distruption for your little one, cause you know within 15 minutes they can turn from an angel to a little gremlin. Don’t try and move meals and sleep around too much. Stick with what you typically do for your day. As long as your little is getting up for the day by 7am (and everything else is in place), then in a few days things will be back to “normal.” Just be consistent. But we’re not sleeping at all. And if sleep is just not happening in your household right now, then maybe now is the time to think about whether you and your little is ready for some better sleeping. By adjusting a few things like wake-up and nap times and changing some associations around sleep, your little can be sleeping great too! Daylight savings is a really great time to make some changes because you need to adjust to the new clock time anyway.